Over the last while we’ve all known that Waterstone’s were ‘in trouble.’ I hate it when bookshops close, it is as if the soul goes out of a town once the books go. But here’s the thing, I want to rewind to my opening line and look at the words ’in trouble,’ and seriously ask what that really means? I’m an old fashioned kind of writer and business person. Books have stories and poetry in them, literature is about life and business is quite a straightforward matter; or it can be. A company provides a service, they let people know about it, people buy the service at a price where they get what they need and the company make enough money for its people to live for a while and do some more work. But that is not business as it is now, I can hear you say even as I type this. You might think that I’m a simple fool, and you’d probably be right. This is why perhaps there is part of me is glad that the high street is failing, and that means HMV/Waterstone’s too. 3 In order to to attain maximum profit you should only sell what sells quickly and for the highest buy/sell margin (though cheaper volume sales can also be part of this). The myth of continuous growth is a strange one. Imagine if your son or daughter continuously grew, soon you would have the most freakish child, and then what about adulthood as they grew and grew? This idea flies completely in the face of the idea of decent business, obviously it is rooted in a greed basis, which itself is part of the PLC and shareholder dynamic of today’s corporate mechanism. The antidote to this is very simple, create businesses where enough is enough. Continuous growth says there is never enough. There is perhaps at the very core of this a spiritual problem in that it stems from the belief that if one has as much money as possible there will be nothing to fear. Sure there are amazing things that money can do, but I think it is time to actually examine the growth culture and consider what business really means. The purpose of the economy is the economy. A machine which feeds its own machine. Is that right? So what is all this economy actually for? Steven Covey in the Seven Habits of Highly Effective People, states that ’we should begin with the end in mind.’ So the question is what is the purpose of the economy? Shouldn’t it be creating an ecology? By that I mean this fuel of economy should make something, contribute to the world we live in. In greed mode it creates smaller and smaller islands where shareholders and CEOs believe themselves protected from the difficulties of life. HMV since the buying of Waterstone’s have pursued the common high-street strategy of cutting expenditure on highly qualified staff, cutting maintaining mid-list and specialist sales and attempting to push towards high turnover volume sales. Recently I wanted to buy a copy of The New Yorker and went to Watestone’s in Manchester only to find they had stopped selling magazines of this type as they only sold four or five copies a week, that’s what the sales person told me. So on that day they lost a sale, and any future business from one of their customers. 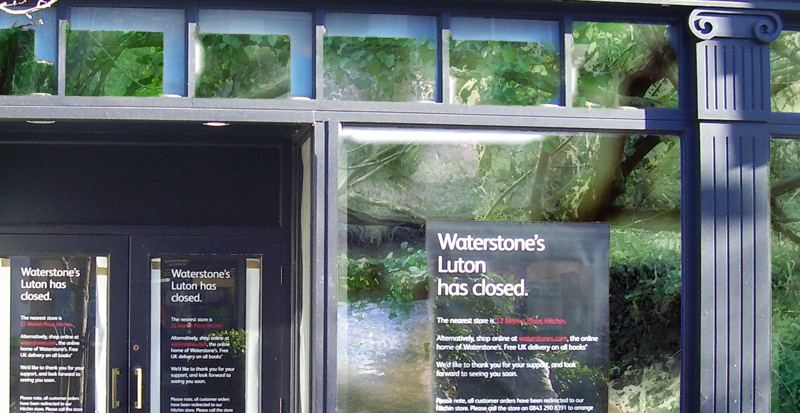 The fact is that Waterstone’s are not closing branches because they are not profitable, it is that they are searching for the holy grail of continuous growth rather than being satisfied, flexible to the needs of their locale and aiming to be the best bookseller on the street. All sorts of excuses like the internet has cut profitability and digital sales are decimating the business are like those politician’s rehearsed arguments which seem to present something we will believe and which will let them off the hook. In reality it seems to be that they don’t want to do business at all unless it is based on a fairytale. I’m glad they’re failing. Any company which doesn’t believe in its customers, or isn’t prepared to adapt to their needs, which does not have a good end in mind, or run on decent principles should fail. What I would love to see rising out of this are non-corporate based businesses which understand that earning enough is enough. It would take a huge shift in culture, but there are really good examples of it starting to come through if you dare look. Where I live in Hebden we have a large number of sole trader/boutique businesses and very few chain-stores. Our shops do get some things wrong in that the local economy is perhaps over-geared to tourism and sometimes misses out on a very important collection of people, i.e. those who live in the town. But it is a very interesting model. I’m not a bookseller myself, writing books is my calling, but if I were, or felt the inclination and had a bit of nerve, I’d open a bookshop right where Waterstone’s used to be, this is exactly the right time to do it. A very thought provoking article John and one which I entirely agree. It's very sad that we are such slaves to profits and greed - I see it first hand as my husband works for a multinational. It is, as you say, all about year on year profits. Luton is a university town - with no bookshop. How sad is that? Yeah, greed is our problem. Warrington lost the best store in town recently when Borders closed. People used it like a library. Like losing a gym it was. Think it's time to dig out battered thin classics now in decrepit second hand bookshops - thankfully we still have one of those. Celebrity doorstop autobiographies in Waterstones will hardly be missed anyway. John makes a very important point, which, like many revelatory realisations, seems so obvious once revealed. The bookshops are seeding their own destruction in so many ways, and this economic myopia is a major contributor. But who will listen?